Today I have glued the Pegasus and pylon onto the top of the fuselage with styrene cement. Contact points are minimal so once all is dried I will run a nice thick bead of epoxy round the edge. This will be hidden under the filler that will blend the whole lot together. I also glued the jet nacelles to the wings. Yet more filler will be needed to blend these together. 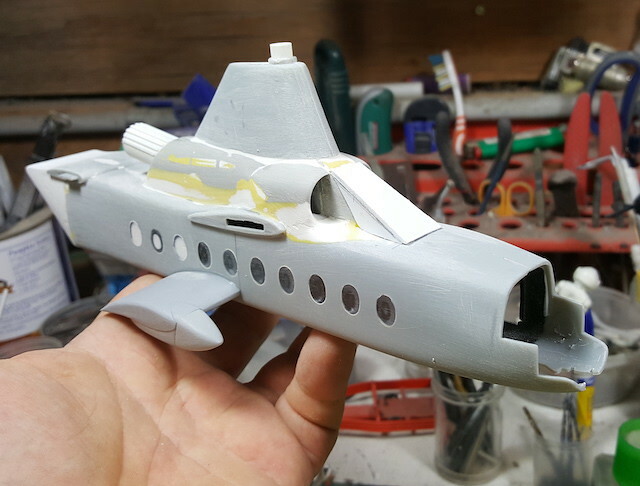 Filler will also be needed for the many sink marks on the fuselage and for the steps where the fuselage halves didn't match up well. I haven't glued the undercarriage sponsons and stub wings on yet but I am pretty sure that they'll also need filler. Remind me to buy shares in Isopon, Humbrol, Squadron, Presto and anyone else who makes filler. Tamiya Polyester (AKA stinky yellow) and PPP in my case. Stinky yellow putty has been applied to the join between the Pegasus and the Rotodyne. I will shortly go down to the shed and sand it. Today I sanded back the Stinky Yellow and then added PPP to build the contours up to finished profile(ish). She's grown sponsons, become a bit smoother and i've extended the Pegasus fairing. Developing nicely Fred, that exhaust pipe impresses me every time I see it. I winder if the 'dyne used stock Viscount window frames, they're a very similar shape and size, ie BIG! I've spent may hours sitting alongside a BMid Viscount window while trekking across to Holland in the 80s, and they're certainly in the large side! ...and was startled by a puff of smoke from that exhaust. I thought it was going to start! I have to go to the model shop tomorrow. I have almost run out of PPP. Looking really good! I have to remember using Harrier intakes like that for future projects. And the good thing about that idea is you don't have a whole Harrier left over, as you can buy just the intakes from a few suppliers these days.